I am honoured to be featured in the February issue of Gardens Illustrated as their 'Horticultural Who's Who' person for the month. The picture, taken inside the cottage, is by Charlie Hopkinson, while the article accompanying it is by Annie Gatti. The magazine should be available in the next day or so. In a rush of publicity, Colesbourne Park is also featured in the February issue of The Garden, with photographs by Torie Chugg and article by Stephen Anderton, and the same issue contains an article by me on hepaticas - though most of the information was provided by John Massey. Colesbourne Park and the snowdrop display are featured in the Telegraph Magazine today, sharing its space (inter alia) with an article 'forensically' discussing David Beckham's underwear. Written by Stephen Lacey with photographs by Andrew Lawson, 'our' article is a well-written look at the history of the Elwes family and their connection with snowdrops, with commentary on a few good selections and the gardens themselves. It's available online. Juvenile foliage of Taiwania cryptomerioides - needle is a good word for these sharp leaves. 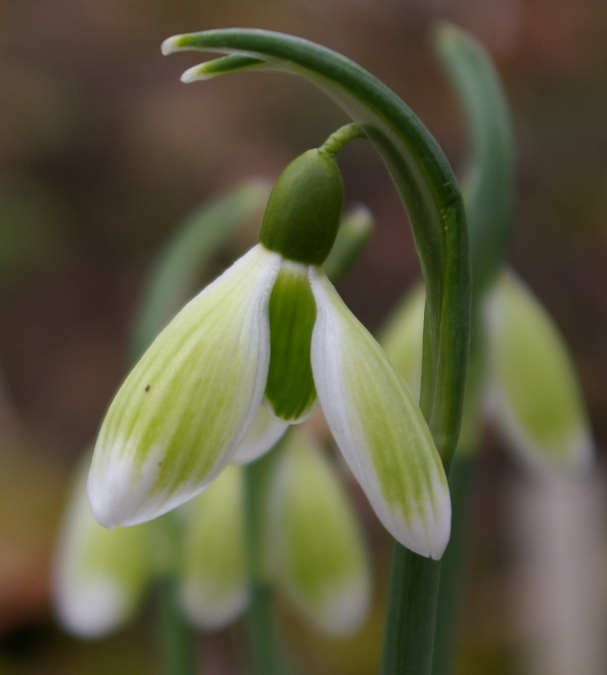 Galanthus 'James Backhouse' - just coming into bloom. The flowers haven't expanded and opened yet. 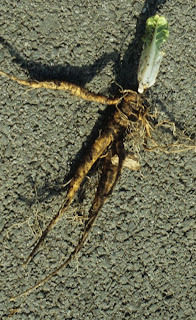 A friend in Ireland, who wishes to remain anonymous, has sent me a picture of this indubitably 'male' mandrake root lifted from his garden. In the past such strategically forked roots were particularly valued for their supposedly superior medical qualities, and it seems as if there was a quite an industry in the middle ages, fabricating little homunculi that were said to be mandrakes, complete with faces, hair and genitalia. It's now known that mandrakes (Mandragora autumnalis or M. officinarum), like many members of the Solanaceae, contain a diversity of potentially hallucinogenic alkaloids, which could have given an interesting experience in the hands of a competent herbalist - or been fatal in other cases. No doubt to protect the trade, the ancient herbalists invented myths about the origins of the roots, and fabulous methods for harvesting them, needed because of their potency. The most famous is that when dug the mandrake shrieks, with fatal effect to all who hear it: in consequence it was necessary to very cautiously excavate the root and for the final tug tie it to a dog, while retreating out of earshot. As the dog responds to a call it yanks out the root, but in so doing hears the scream and dies. This legend dates back to classical times and is charmingly illustrated in this illustration in a Pflanzenbuch of about 1500, by an anonymous herbalist from northern Italy, now kept in Munich (from Blunt & Raphael, 1979, The Illustrated Herbal). I've only dug up one mandrake and was really quite disappointed when it didn't scream, but it re-established, which was more important. A few photographs from Colesbourne Park on a beautifully sunny but chilly day. The mild winter has brought many plants out earlier than usual, though the snowdrop display is still a long way off its peak and the colder weather over this weekend will gently apply the brakes. Galanthus 'Ophelia', picking itself up after overnight frost. It has been a beautiful sunny and mild day, with the early flowers actually getting the chance to open and a diversity of insects on the wing. Too soon, perhaps, but very enjoyable. Trafalgar Square at first light: the Keep out of London countdown clock at right. Head and tail of the queue, c. 7.30 am. ﻿Yesterday we went up to London to see the amazing exhibition Leonardo da Vinci, Painter at the Court of Milan at the National Gallery. Although long flagged-up as something not to be missed, we failed to book tickets (it was sold out by the time it opened) and thus had to queue for the daily allocation. Taking no chances, we drove into London allowing Adrian to be in place by 5.30 - but even then he was fifth in the queue. I went to park in the suburbs and returned by tube. The queue grew and grew and hopefuls kept coming until we got inside at 10 am, though we learnt later that nobody who had arrived after about 7 am got in. The exhibition has brought together half of Leonardo's known paintings, all of them done, or started, while he was working in Milan between 1482-99, together with sketches by him, and a supporting cast of work by his contemporaries and pupils. These show not only his influence, but also that he was indeed the master. It is a unique gathering of remarkable pieces, of which the star is perhaps the radiant Portrait of Cecilia Gallerani, widely known as The Lady with an Ermine, borrowed from Cracow, and there is the chance to see the newly accredited Christ as Salvator Mundi, though damage has caused this to lose its lustre. It's also nice to be able to see Giampetrino's copy of The Last Supper at eye level, rather than 'skied' on the wall of the antechapel at Magdalen. ﻿This is an exhibition of Leonardo's works as a painter, and one has to put aside all thoughts of him in his various other guises; the architect and inventor appear only from doodles on the sketches, and there are none of the exquisite botanical drawings that place him still among the great botanical artists. In fact one has to look quite hard for any images of plants, and when found they are quite surprising. In the largest room of the exhibition two versions of The Virgin of the Rocks altarpiece face each other, brought together under one roof for the first time. The story of how they came about is complicated - see the catalogue - but the older one is the Louvre, and the younger, perhaps by about 15 years, is in the National Gallery's permanent collection. At first glance they look rather similar - a group of holy figures in a fantastic rocky landscape, but there are subtle differences in the imagery of the figures and their settings, and to me there is a surprising - if not shocking - difference in the plants in the landscape. In the French painting the plants are beautifully rendered, with the detail one expects from the great botanical artist that Leonardo was: an Iris, Polemonium and Aquilegia are clearly recognisable. Replacing the Iris in the London version is a clump of apparent Narcissus tazetta - but it is no normal daffodil. The flowers are good enough, but they arise on bracteose scapes, from a clump of plantain-like leaves. Next to this are two completely fantastical plants that cannot be identified, and there are other oddities elsewhere in the landscape. It seems that here Leonardo, the inveterate doodler and inventor, has invented his own flowers for Paradise, and in the evolution of the painting has translated the scene from an earthly to a heavenly location. It is nice to think that he envisaged daffodils there. Detail of fantastic plants in the London version of The Virgin of the Rocks. Helleborus niger and a red Pelargonium flowering together in a front garden at Kew today. Nice though it is to receive Christmas cards, there comes a point when they outstay their welcome and the house resumes its normal decoration of cobwebs. The selection of cards depicting snowdrops was slightly less diverse and numerous than last year, but with a similar mixture of charmers and horrors. Here they are, in no particular order. The mild weather has continued and plants are continuining to develop apace. Several more snowdrops can be added to the Christmas list and both Crocus atticus (sieberi) 'Firefly' and 'Bowles' White' are spangling the lawn. The earliest winter aconites are also out, the reliably early 'Zitronenfalter' and 'Lightning', plus some double-flowered seedlings from the latter, while many hellebores are also opening early flowers. As well as being mild, December was by far the wettest month of a generally dry year, with 124 mm of rainfall recorded here. It brought the rainfall total for 2011 to 674.4 mm, surprisingly higher than in 2010, but still very low. Mean rainfall for the past five full years is 836.6 mm (32.9 inches).